Posted by estesba on Wednesday, March 13, 2019 in News & Events. Click here to see the full program of events. 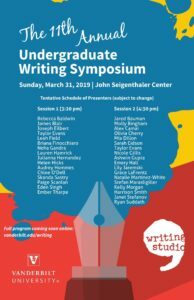 The Undergraduate Writing Symposium will be held Sunday, March 31, in the John Seigenthaler Center (1207 18th Ave. South). This annual event is a showcase for exemplary writing by Vanderbilt’s undergraduates that honors their achievements as writers and scholars. Whether you want to come hear amazing fiction and poetry from your peers or engage with the insights they generated in a wide range of courses—everything from Medicine, Health, and Society to History of Art, the symposium is a chance to encounter the tremendous range of undergraduate writing on our campus. Modeled after an academic conference, the event centers around two hour-long sessions. Each session features a set of concurrent panels, whose undergraduate panelists present and discuss a piece of writing they are proud to share with an engaged audience. This year the symposium has also expanded to include a panel on multimodal writing projects as well as panels each session spotlighting First-Year Writers. Additionally, the symposium will feature Seniors discussing major projects, independent research or honors projects. 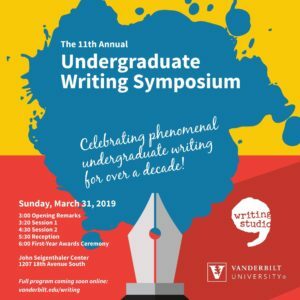 The event will conclude with a reception followed by a Closing Ceremony featuring the announcement of first-year writing awards and Vanderbilt seniors reflecting on their journey as writers across the past four years. Drop in for an hour or stay for the whole event!